Britain’s 300 cheese-makers have had a difficult year as milk prices rise and shoppers turn back to basics. But despite this, Mike Heler’s family business is going from strength to strength. Joseph Heler Cheese, set up by Mike’s father, Joseph, now 85, in 1957, is the largest independent cheesemaker in the UK and it launched its Blue Cheshire in Tesco stores in England earlier this month. The business also exports 1,500 tons of cheese to places such as China, Japan, the Caribbean, the Middle East, Far East and Africa. Mike, 54, says that the business, based just outside Nantwich, in Cheshire, has been helped by gaining halal accreditation, helping it to tap into Muslim markets. The business has 300 cows of its own and collects milk from 100 local farms. It produces more than 40 types of cheese, including Continental-style cheeses, such as Gruyere and Emmental. It has seen a 60 per cent rise in sales since 2009 to £60?million a year. 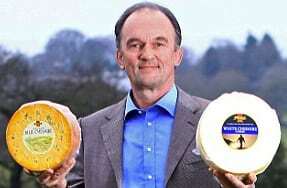 According to Nigel White, secretary of the British Cheese Board, the UK has ‘never produced enough milk to make all the cheese that consumers want to buy’. Most of Britain’s cheese-makers produce less than 50 tons a year, but the top 50 manufacturers account for more than 90 per cent of cheese produced in the UK.